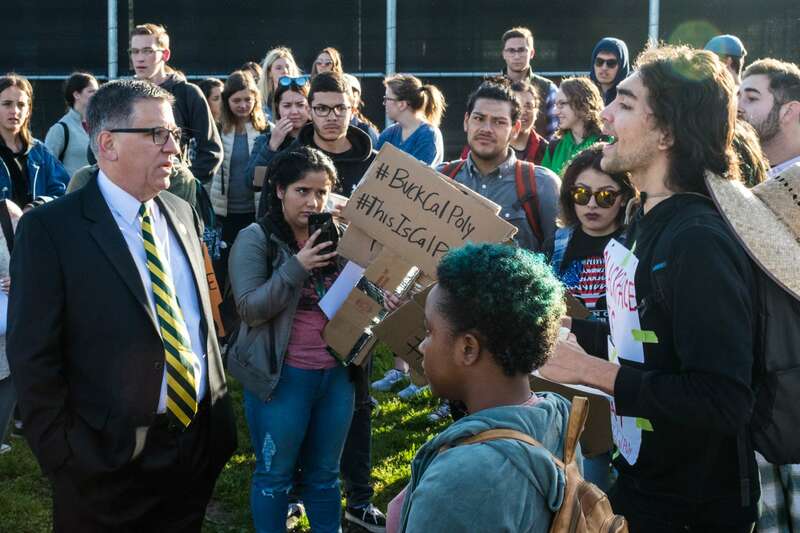 Hundreds of Cal Poly students gathered April 13 at 8 a.m. in the parking lot near Doerr Family Field to protest administration after a Lambda Chi Alpha member wore blackface to a gangster themed party last week. This “Open House Day of Action” march follows protests at the Interfraternity Council (IFC) meeting Monday, Farmers’ Market Thursday, an Emergency Town Hall Monday and an open forum hosted by President Armstrong Thursday. Lambda Chi member and agricultural business senior Kyler Watkins will not be expelled, Armstrong said, because it is not within his power to expel a student for protected speech. The national chapter of the fraternity, IFC and Cal Poly have suspended the fraternity. IFC voted to suspend themselves from all social or brotherhood events for the rest of the academic year April 12. “The culture of indifference toward racism is so deeply embedded that frat boys will throw parties like this,” anthropology and geology junior Kelsey Zazanis said. The students called for the resignation of President Armstrong, increased allocation of funding to multicultural clubs and programs and the end of greek life at the university. The students began marching at 8:24 a.m., and wrapped around Slack Street to Grand Avenue, and walked through campus. Two police officers on motorcycles told the students to move onto the sidewalk, but were unsuccessful. The group stopped at the Recreation Center at 8:50 a.m., where prospective students were funneled into tours. Jacob Zajace, a student admitted into Cal Poly’s mechanical engineering program, heard about the student in blackface Wednesday. “This definitely made the decision a bit harder,” Zajace said. Zajace is considering between Cal Poly, Purdue University and the University of Washington. A group of police officers stood between the protesters and the pathway into the Recreation Center. Officers repeatedly told students to clear the wheelchair pathway. According to political science senior Matt Klepfer, protestors checked in with police officers and protestors many times to ensure ramps were clear. Klepfer noted wheelchair accessibility was a priority for the ‘Day of Action’ organizers. At 11 a.m., students were walking around Ag Showcase in the Farm Shop (building 9). The Drylongslo Collective, a collective of students, also released a list of demands this morning, which included training on race issues for new pledges and to match spending on security for Milo Yiannopoulos and use it to fund the Black Academic Excellence Center, Ethnic Studies Department and other support groups. Additional Mustang News staff members contributed to this story.